Here's a review for NYX Concealer in a Jar. I have been using these for months so I think it's time for a review! Got the picture from Google Images. Previous hotlinked images to NYX were removed several times. It all started when I searched a frantic search for the perfect undereye concealer. I figured all my other liquid/stick drugstore concealers weren't really doing anything for me. So I decided to find a creamy concealer which would ensure better coverage for my dark eye circles. And so I found NYX! 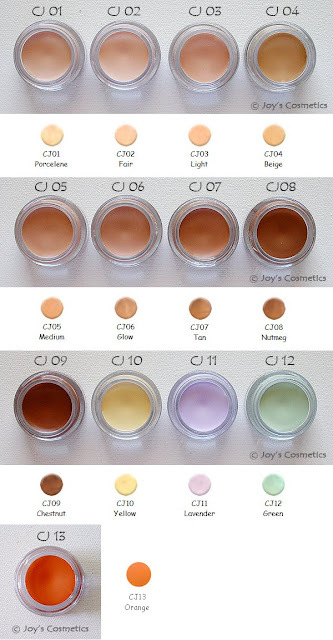 NYX Concealer in A Jar has a total of 9 concealer shades (that's a huge variety). They also have 3 colour correctors shades, namely Yellow, Green and Lavender. These concealers/correctors come in a glass jar. It's almost a 5g sample jar size except the glass is extremely thick, making it look bigger. Currently, I'm using Beige for my undereye circles. I also have 2 correctors: Yellow and Green. Beige is a slightly darker match for my NC25-30 skin. I prefer using a slightly darker undereye concealer shade as I think it works better in terms of coverage. I hate it when I was pushed to buy lighter concealer shades by sales assistants and ended up making my dark eye circles look ashy instead. Would describe Beige as a medium beige concealer with lots of yellow in it. (The picture I posted was not taken by me but it certainly looks like Beige in that picture.) It was perfect for me to use for concealing. The consistency is very creamy (not dry creamy but smooth creamy) and very easy to blend. Of course it would still cake and show off your fine lines if you pile on a lot so you just got to use it moderately. I really like that it's buildable and gives good amount of coverage. I must say I really love it! I've tried it for concealing acne and such but I don't think it's as good as compared to using it to conceal. It doesn't last as long for me. Moreover, this concealer contains mineral oil. I wouldn't really advise it for using it to conceal pimples as it might just irritate it instead if your skin is very sensitive towards mineral oil. The correctors, however, were a disappointment for me. They are not bad but not what I expected. I wished they were a little deeper in colour. Yellow is meant for correcting dark eye rings. It's a bright pastel yellow shade. When applied, it sheers out but on my eye circles, it comes off as a whitish patch. It doesn't really does much for me nor neutralises the purples tones in my eye circles. It certainly goes the job of brightening the eye area but I wouldn't use it alone. I think it would be better for those with fairer skintones as the "whitish patch" wouldn't be as obvious. Green was a recent purchase. It is meant for neutralising redness in the face. It's a minty green shade. I used this on my acne just to see if it helps in reducing redness. My verdict is you really need to use just a minimal amount or the greenness would be obvious on the face. I'm not a fan after using it as I find it too much of a hassle. And maybe I shouldn't be using something with mineral oil on my acne (I'm sensitive to it.). But I think this would be great for those with rosacea problems and really want to neutralise all the redness on their face. That's about it. Overall, I still like these concealers. Mineral oil bugs me at times but for the price, it's really worth it. I can't remember the price but I believe it's 5 USD or even less during sales. If you are really in need of a concealer, this product is definitely worth a try.